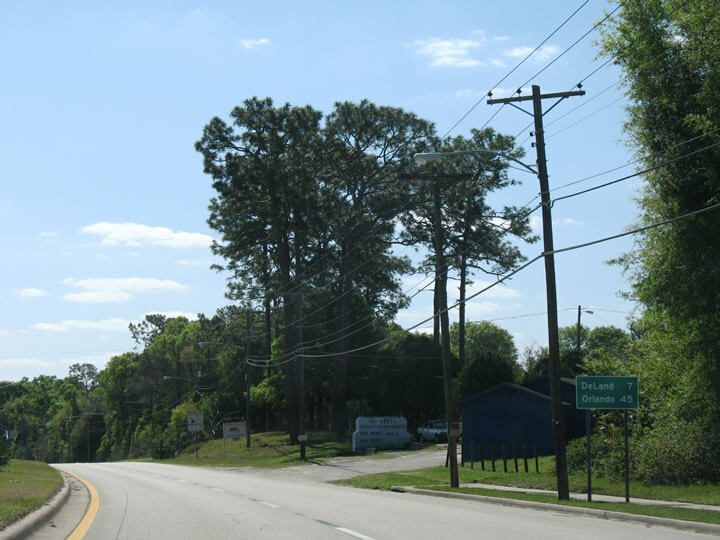 North of Jacksonville in Duval County, U.S. 17 follows Florida 5/Main Street, then connects to Broad Street and Riverside Avenue southwest of downtown. 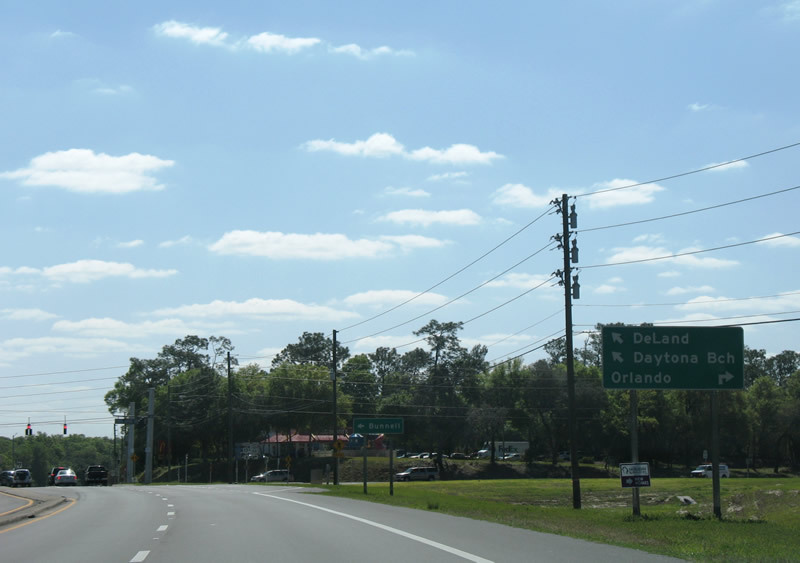 Here, U.S. 17 and Florida 228 approach Interstate 95, which connects to transcontinental Interstate 10 west of downtown. Photo taken 08/23/04. 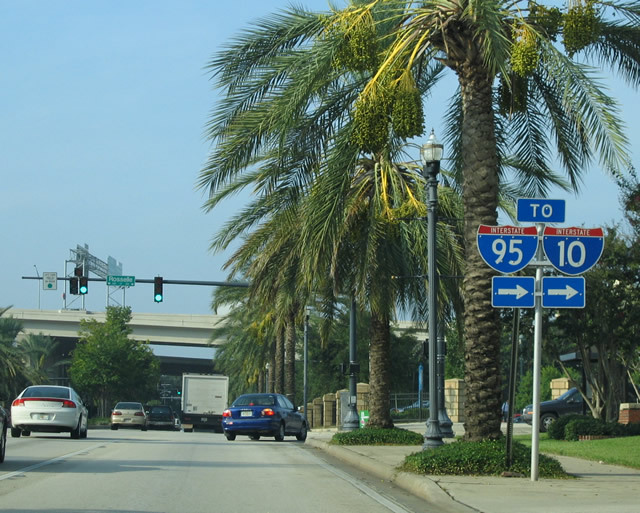 Three-digit Interstate 10 and Interstate 95 shields are used as trailblazers along southbound U.S. 17 and Florida 228 (Riverside Avenue) as the highway prepares to pass under Interstate 95 near downtown Jacksonville. Photo taken 08/23/04. 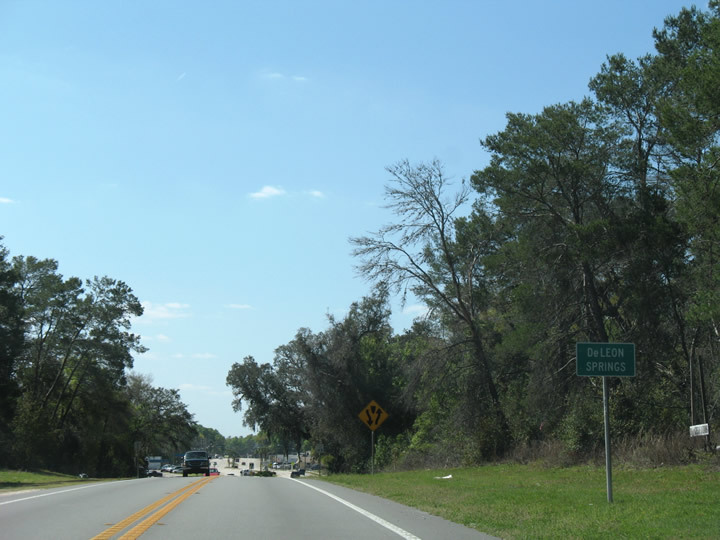 U.S. 17 enters the unincorporated community of DeLeon Springs south of Spring Garden Ranch Road (unsigned Volusia County 4030). Photo taken 03/21/08. 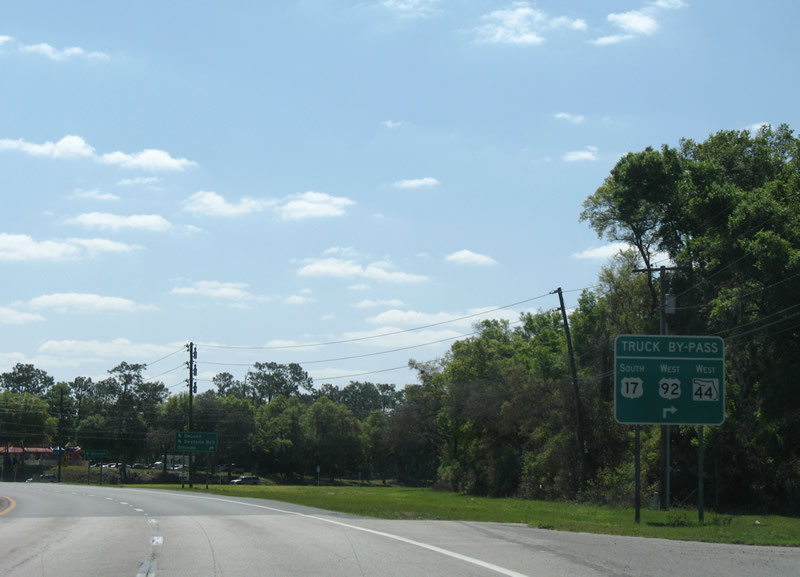 U.S. 17 widens into a four-lane divided highway through DeLeon Springs ahead of Baker Street and Ponce DeLeon Boulevard (unsigned Volusia County 4023). Volusia County 4023 follows old U.S. 17 northward to Lake Winona Road north. Photo taken 03/21/08. 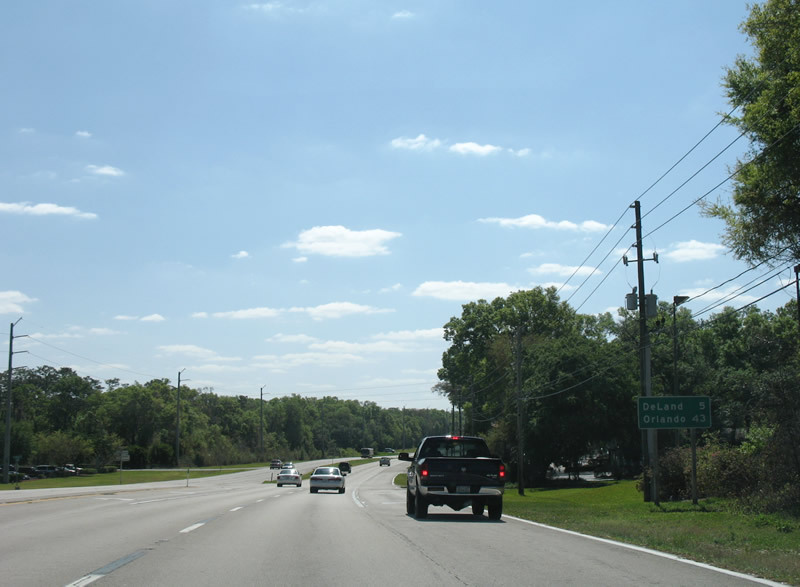 Approaching Volusia County 4053 (Grand Avenue) on U.S. 17 southbound. Volusia County 4053 provides access to the Lake Woodruff National Wildlife Refuge to the west on its southerly course to Glenwood. Photo taken 03/21/08. Volusia County 4053 follows Retta Street west one block to Grand Avenue south. 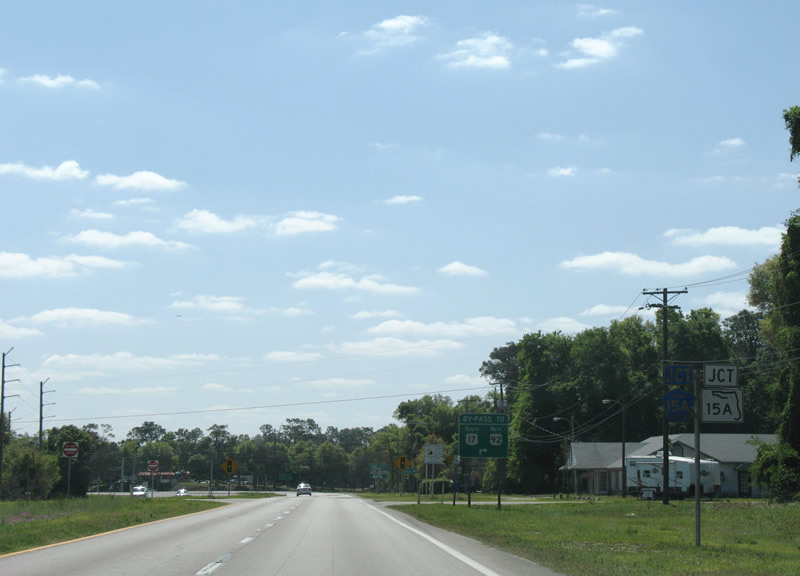 Overall the county road travels 6.61 miles between DeLeon Springs and Florida 44 (West New York Avenue) outside DeLand. Photo taken 03/21/08. 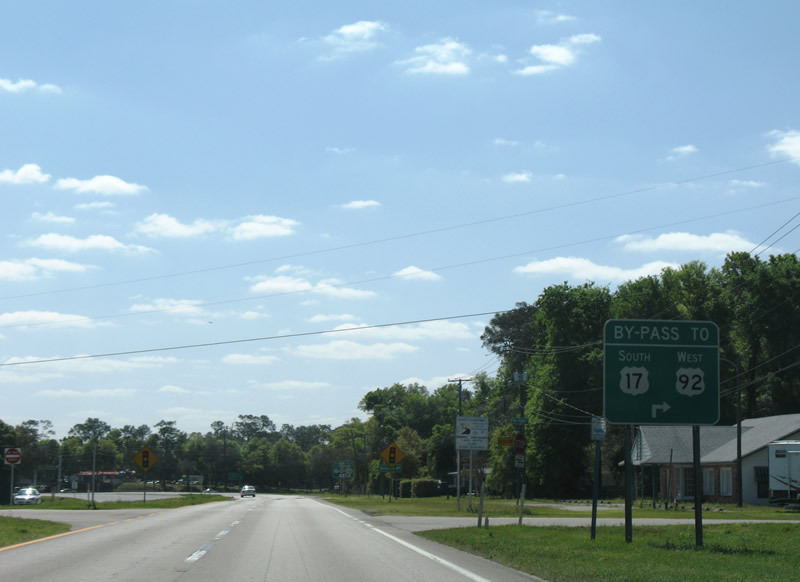 U.S. 17 veers southeast from DeLeon Springs toward north DeLand. Downtown is another seven mile drive southward. Photo taken 03/21/08. A stretch of rural road carries U.S. 17 between DeLeon Springs and the northern outskirts of DeLand. Photo taken 03/21/08. Nearing Florida 15A south & Volusia County 15A north. 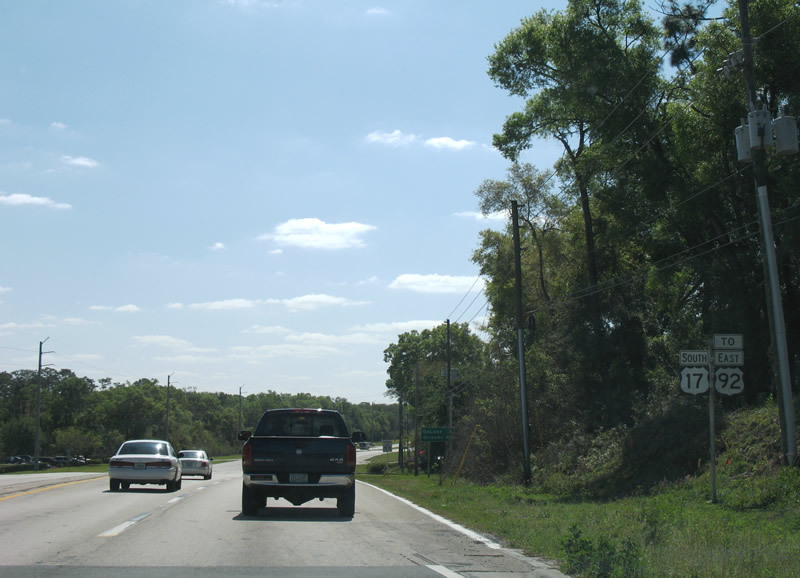 Florida 15 is the unsigned companion of U.S. 17, so Florida 15A relates to its parent as a truck bypass route of central DeLand. Photo taken 03/21/08. Large guide signs direct motorists to Florida 15A to bypass historic downtown DeLand. 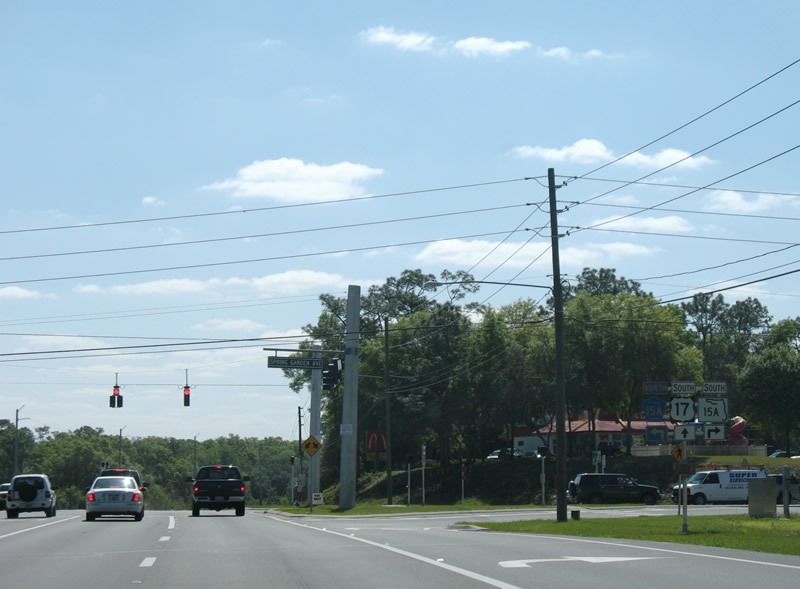 Florida 15A provides a four-lane route through west DeLand while U.S. 17 merges with U.S. 92 west along two-lane Woodland Boulevard. Photo taken 03/21/08. 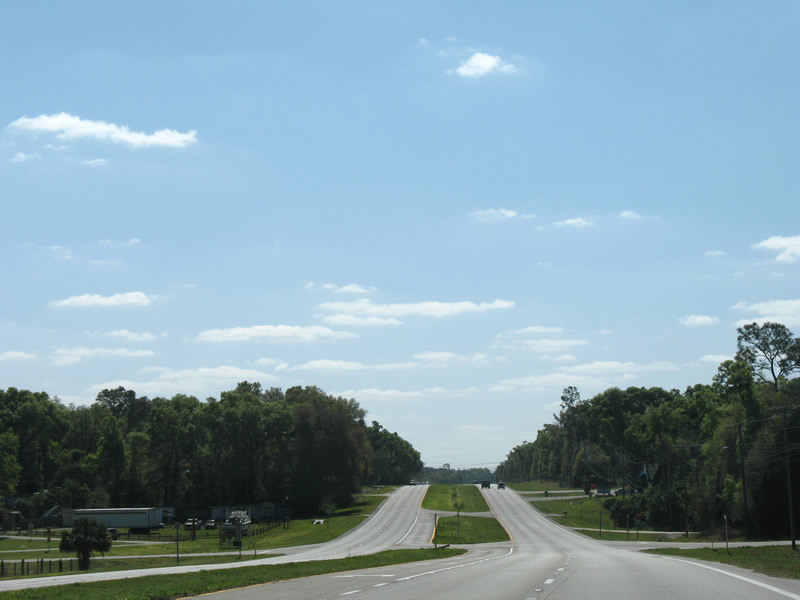 Interests to U.S. 92 East for DeLand Municipal Airport and Daytona Beach should remain on U.S. 17 south. 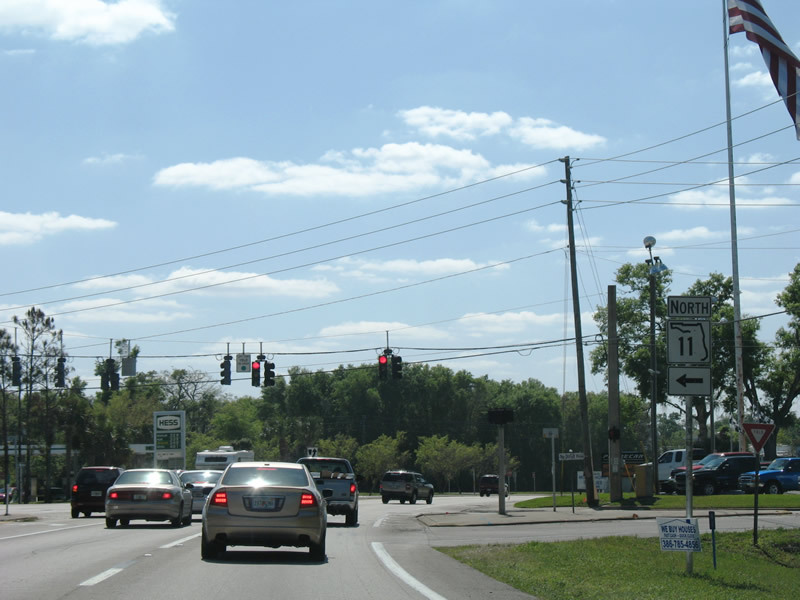 Florida 15A returns to U.S. 17 with U.S. 92 at Taylor Road on the south side of town. Photo taken 03/21/08. 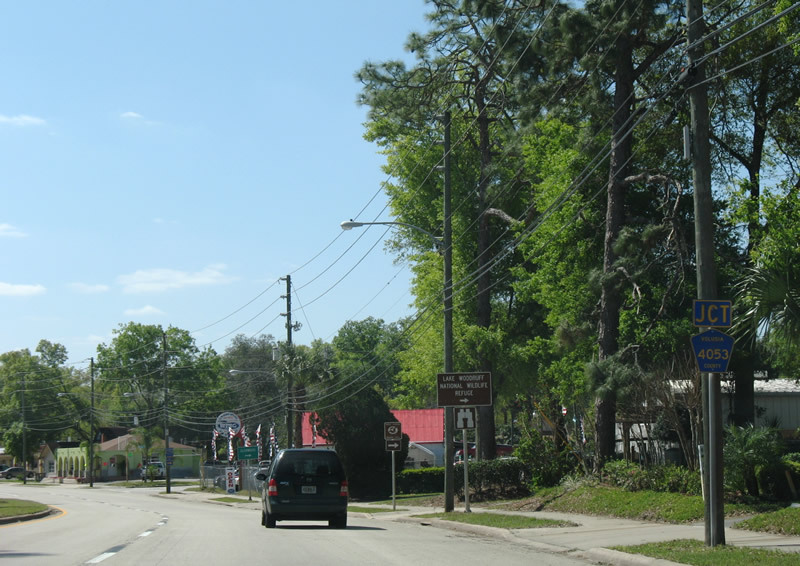 Connections from Florida 15A (Spring Garden Avenue) lead motorists to Florida 44 (New York Avenue) west to Eustis in Lake County. Photo taken 03/21/08. 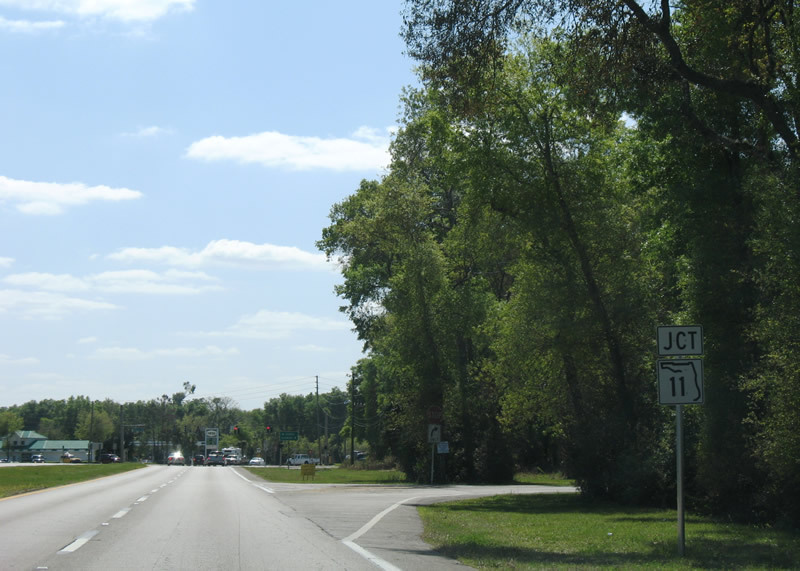 U.S. 17 south at the north end of Florida 15A and south end of Volusia County 15A. 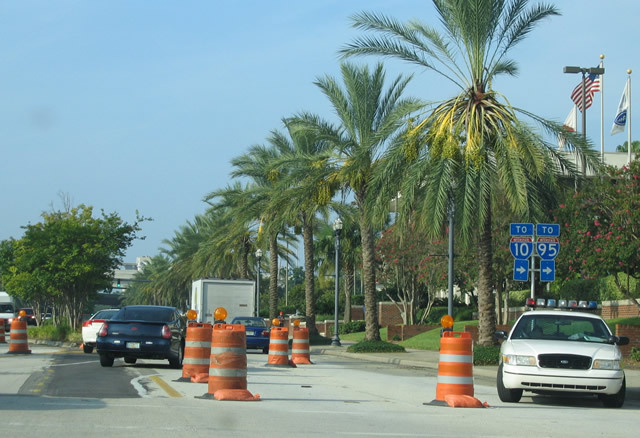 Volusia County 15A continues Spring Garden Avenue northeast to Florida 11 at Crystal Lake. Travelers destined for Orlando can take either Florida 15A south or use U.S. 92 east to Volusia County 4101 south to Florida 44 east for Interstate 4. Photo taken 03/21/08. U.S. 17 (Woodland Boulevard) reassurance marker and companion U.S. 92 east trailblazer posted after Florida 15A / Volusia County 15A (Spring Garden Avenue). Downtown DeLand remains five miles to the south. Photos taken 03/21/08. 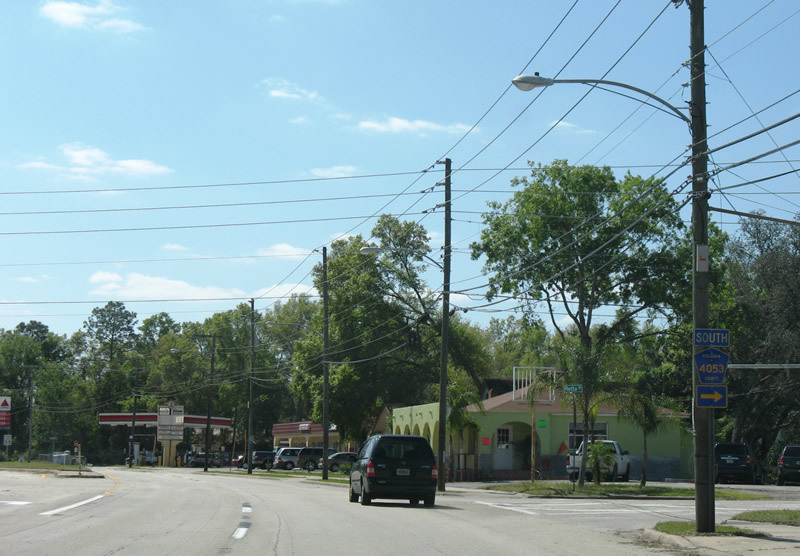 Approaching the south end of Florida 11 (Perkins Highway) on U.S. 17 (Woodland Boulevard) south. Florida 11 joins DeLand with Bunnell in Flagler County. Photo taken 03/21/08. Volusia County 4088 (unsigned here) travels west from the intersection of U.S. 17 and Florida 11 along Glenwood Road to Volusia County 4053 (Grand Avenue) in Glenwood. Photo taken 03/21/08. 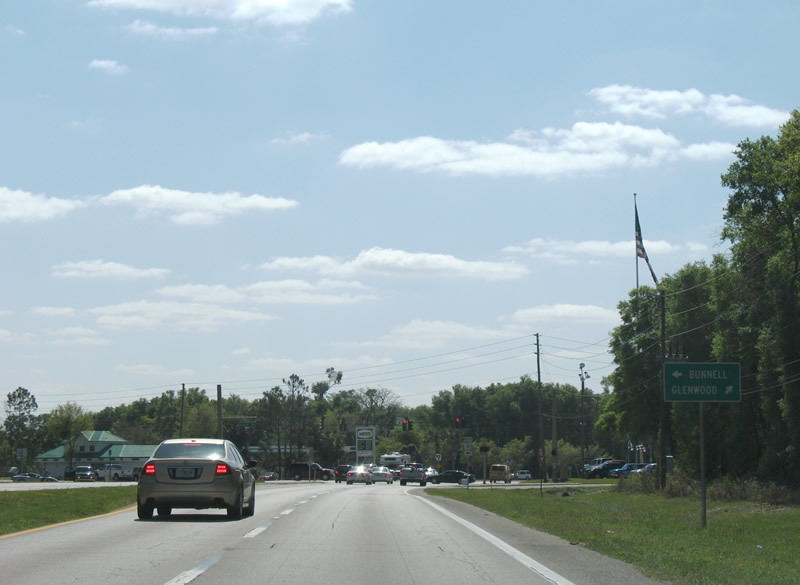 Southbound U.S. 17 at Florida 11's northbound beginning and Volusia County 4088 (unsigned) west. Florida 11 leaves DeLand quickly for rural environs on the drive northward to Bunnell. Photo taken 03/21/08. 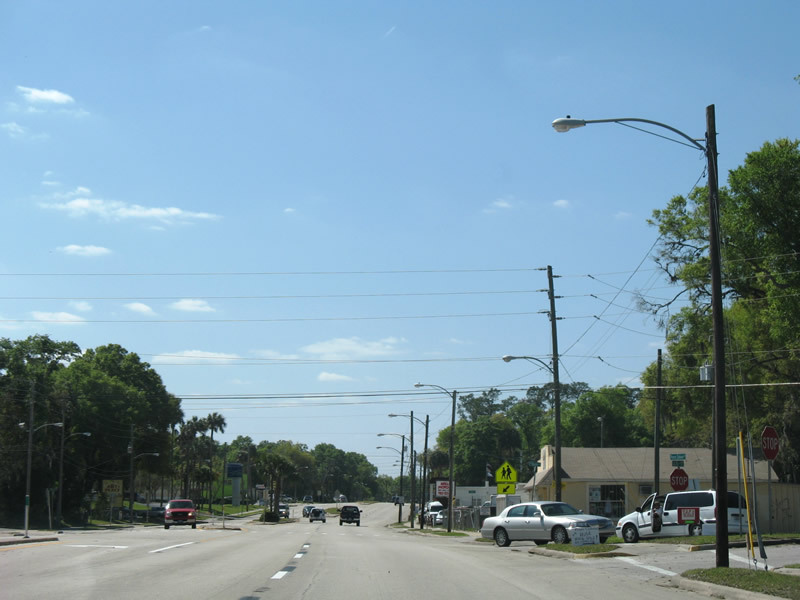 U.S. 17 (Woodland Boulevard) enters the city of DeLand and encounters a shopping center laden intersection with U.S. 92 (International Speedway Boulevard) and Volusia County 92. 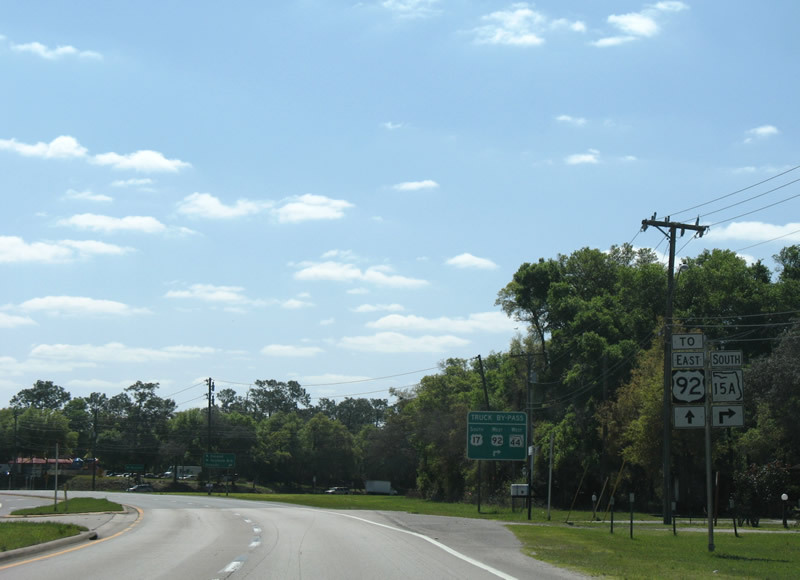 U.S. 92 enters DeLand from Daytona Beach to the northeast; Volusia County 92 continues International Speedway Bouelvard west to Florida 15A. Photo taken 03/21/08. 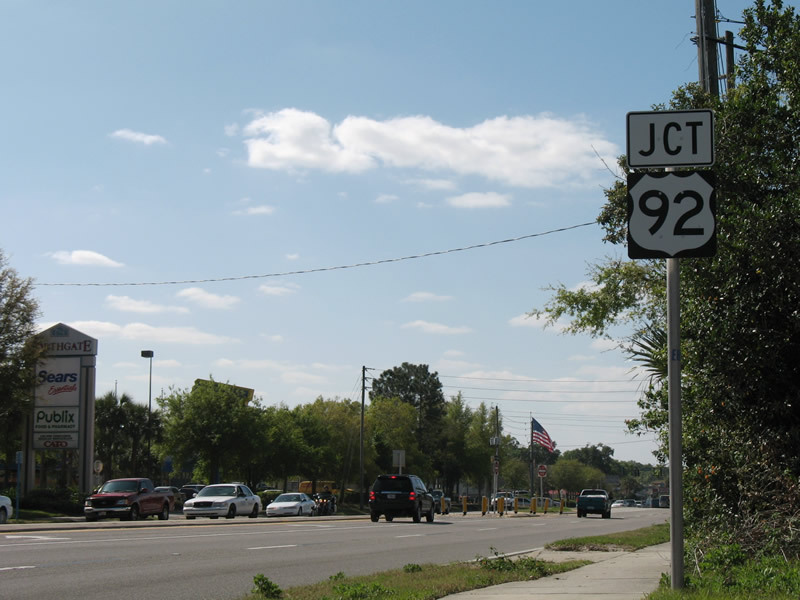 Junction U.S. 92 shield posted on U.S. 17 (Woodland Avenue) south. 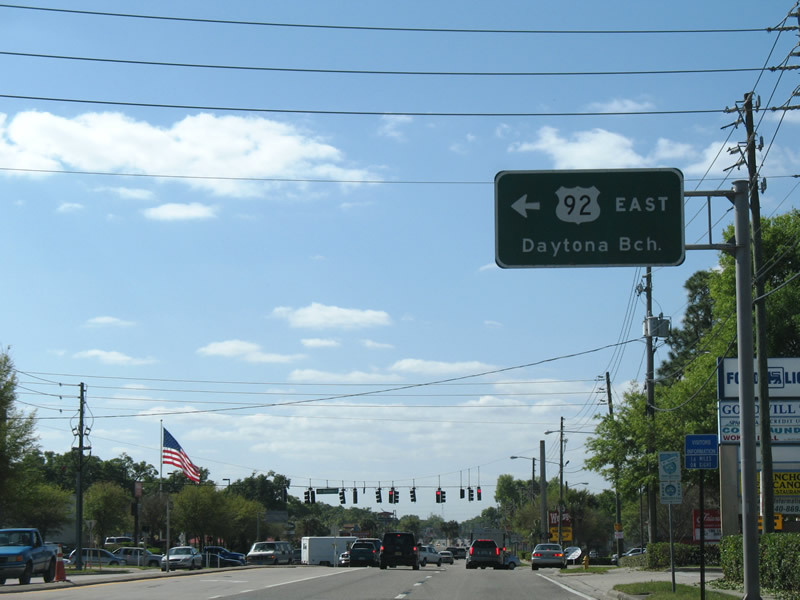 U.S. 92 constitutes a four-lane divided highway leading east to DeLand Municipal Airport and Daytona International Speedway in Daytona Beach. Photo taken 03/21/08. Page Updated May 11, 2008.